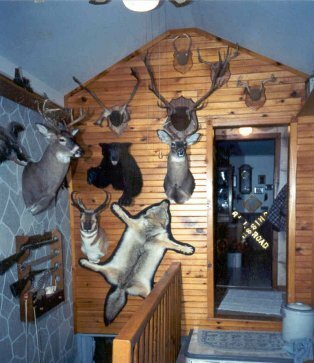 This is our back porch/trophy room. We will soon run out of room, then what? I think there is room for a moose and mule deer head! You may click on one of the above links to view that hunt or scroll down for our main page. Also make sure to read the story at the bottom of this page. Here is my nephews Rob and Steve Modderman with their eastern Nevada mule deer, fall of 2002. They packed in several miles with their own horses and gear. Hope to be with them sometime in the future!! Rob Modderman with his nice 2002 Nevada muley. Nice hat also! My friend and brother-in-law Bob Modderman with my 1999 northern Ontario caribou. We spent 10 days in a pick-up together and drove 3200 milies and had a great time. Here is an old picture. Brother Steve, nephews Nate and Steve Modderman, and Scott Smith along with my boy Noah on a deer hunt in the UP about 1992. This is a little different kind of trophy. Doug Sheridan presenting me with the 2001 Michigan State Auctioneers Asso. Bid Calling Champion Trophy. This is a picture of 10 happy hunters with 20 nice caribou, taken on our 2002 northern Quebec fly in wilderness hunt. November 15, 2000, 12 noon. Out back of the barn hunting of my blind. This is the nicest buck I have taken to date. Noah's 1998 8 point taken back behind the house. The biggest buck he ever took. Here am I with my two bucks I took in 1998. Behind me is the blind I have shot alot of bucks out of nick named the "Corn Field Condo"
This is the second buck taken in 1999. This is the prize that the story below is all about. This is my father-in-law, Lloyd Titus, with this great big buck. Lloyd and Mark with Mark's Black Bear he got hunting in Canada. Mark has been with the Auction firm for about 15 years. Be sure to ask him ask him about it at our next Auction! Hunting with outfitter Al Bassett out of Mellstone Montana. Oct. 1998. I had been wanting to go after antelope for a long time when this hunt came up on a S.C.I. auction with the Bow Hunters Chapter down in Holland. I bought the hunt at the auction and Kim and I took a 2 week trip out west and included this hunt in the plans. We had a very nice time and was also able to take a nice coyote pictured below. I took this bear in Canada in Sept. 1997, hunting with Lloyd & Mark Titus and Dennis Luke. As seen in Jays Outdoor Journal, The Christian Outdoor News and Safari Club News. What is worse than not getting a buck? Preparing, scouting, hunting and shooting a nice buck, only to have someone else claim him and then to lose him in a coin toss! According to my older brother Steve Smith, all good hunting stories must start with what was served a breakfast and who was there. Opening morning, 5AM saw us gathered at our farm house for a good breakfast of bacon, eggs, fried potatoes, toast, coffee and OJ. My friend Carl Swanson, his son-in-law Eric Proseus, my son Noah and our new Pastor Doug DiBell, Solon Center Wesleyan Church, were all gathered for opening day breakfast. Carl and Eric were going to hunt on another farm in Ensley township, about 8 miles north of our small farm on 19 mile road, west of Cedar Springs, Mich. After breakfast Noah headed into the state land south of 19 mile road where we have had a deer blind for about 15 years. Pastor Doug and myself were going to hunt north of the house on private land. Pastor Doug was in a tree stand put up by another church friend, Joe Watson. My blind, which Noah and I had set on an old hay wagon and backed into the fence row on the edge of my corn field was ready and waiting for me. We had placed it so I had a good line of vision down the pipe line which ran through the state land, then across our land. November 15 was uneventful as I never saw a deer. Tuesday looked like it would be another slow day when, like usual, all of a sudden about 8:15 AM I spotted a buck running right at me down the pipeline. "Just like I planned it" I thought. One shot at 130 yards from my 300 Weatherby Mag and down he went. The weeds were about 2' high so I waited about 30 seconds with my scope on the spot to be sure he wasn't getting up. Just as I was gathering my stuff to head over and field dress my buck I saw two orange clad hunters walking up the pipeline. "No other shots" I thought," shouldn't be any problem". I was about half way across my corn field when the other two hunters reached the buck and stooped to roll it over. I couldn't see it yet in the weeds so I hollered "Is he down?" One guy called back "did you shoot at this deer?" "Yes" I said. " Shot him right in the chest, he was coming right at me"/ "No hole in his chest" he said, "
I shot him in the neck". By then I was up to them and saw my shot had hit him in the mouth and exited right behind the ear. " I didn't hear any body shoot" I said." Must have sot at the same time" he said. "Where were you when you shot?" I ask. He pointed down the pipeline to the state land about 200 yards. "He was running away from me and I aimed for the head" he said. I told him if he was shooting at a running buck at 200 yards and was aiming at his head, he was a lot better shooter than I was. I was so upset that these guys were claiming my buck that my mind didn't function right at the time. Several things came to mind later, but at the time they never registered. The buck had fallen backward from the impact of my shot from the front. I could have cut open the area of ;the impact and saw which way the bullet passed. Also we were on private land, and they admitted they had no permission to hunt there. Pastor Doug was only about 150 yards away and later he said he only heard one shot. Well, I offered to flip a coin and they quickly agreed. What can I say, they won the coin toss and I went back to my blind and sat and watched them field dress my buck, which by the way was a nice 4 point, and drag him back down the pipe line. Shortly after they started dragging they both stopped and took off there orange coats and proceeded wearing only white tee shirts. Then after they disappeared into the woods about 300 yards away one of them came back, walking the full 300 yards looking for the kill tag, which I saw them rap around the bucks front leg before they left. With all the doe permits and hunters around I don't think I would have walked that pipe line in a white tee shirt even if there was a new Cadillac waiting for me at the other end! Well, so much for my 1st buck of the 99 season. For the next 11 days I sat in my blind and looked down that pipe line and thought how I had given away my buck. I thought about how maybe they needed the venison worse than me. Also the thought that to get another buck out of the same blind was highly unlikely. From Wednesday November 17 until Saturday November 27 not a hair did I see. On Saturday November 27 I told my wife Kim I'd be in by 10AM. "This is my last day to hunt" I told her. "Church tomorrow and back to work on Monday". As usual before sunup I was set up in my blind and as usual all I saw was a nice sunrise. About 9:30 I thought I might as well call it a season and sat up to gather my gear. "I'll give it another 10 minutes" I said to my self. 9:40, time to head up. I crawled out of the blind, leaving my rifle on the chair inside as its hard to get out with the rifle. I am standing outside the blind, on the back of the hay wagon, hooking up by back pack and literally said to myself "Well, that's it for this year." Just then, off to my right at about 80 yards, there was a buck, running across the corn field. I could not hardly believe it!! I jumped in the blind and grabbed my rifle, pulled up and tried to get him in my scope when I realized I had put on the scope cover. Off they came and I found him in the scope ;just as he is one leap from the brush. Ker-bang, and down he went. His head came up in the brush and I shoot again. He disappeared in the weeds. The whole thing lasted not more than 3 seconds. The first thing I think of is there any other hunters around? NO, GOOD! When I get over to the brush I expected to see him laying there but he's not there.After a little looking I see him about 100 yards away across a swale and put him down for keeps with another shot. When I get over to him and confirm he's dead, I look at his antlers. WOW. I have taken 20 bucks but never one worth a shoulder mount. There he was, a nice even 8 pointer. Not a monster by any means, but nice and even and taken off my own place. A real trophy for me. I was as happy as any hunter could be. That's my "Tale of two whitetails" My 99 season went down in my hunting log book as my worst year and my best year. P.S. Those were the only two deer I saw in the 99 season. I was able to take them both, but only one came home with me!! Harry Earle of Pine Beach Taxidermy had donated a shoulder mount to a Safari Club Dinner and I won it so he mounted the buck for me and it is the one you see on my trophy wall.